She does good hair and make-up. She is an expert on beauty trends and knows Elle and Marie Claire inside and out as if they were her best friends. On the corner of South Dixie Highway and Vallete Way, you’ll find that girl. Now all grown up with a business she calls "Citrus Hair Salon and Spa." A hair salon is a woman’s sanctuary. A home away from home. A place to detox, get beautified and pampered. It is where females, young and old, gravitate to like bees to honey. 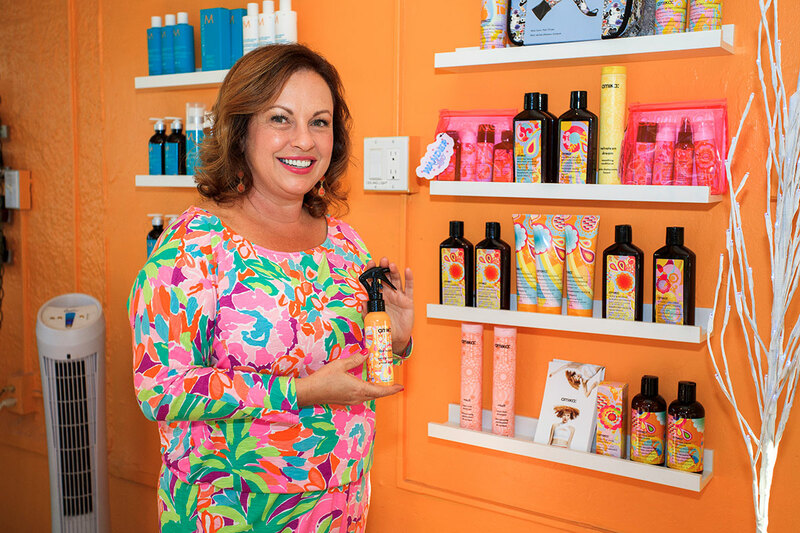 Tina Hardman, owner of Citrus Hair Salon and Spa wanted such a place as her business. 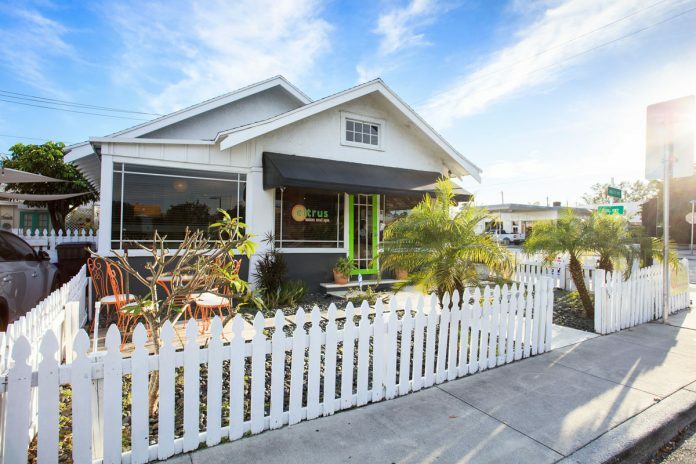 And she found her spot at 1800 South Dixie Highway, just a few steps south from the famous Norton Museum in a corner lot lovingly known as the Cottage Corner. The four charming white cottages, circa 1920s, are owned by four different women with four distinct businesses that complement each other quite well. A jeweler, a tea house owner, a complexion specialist, a hair stylist. 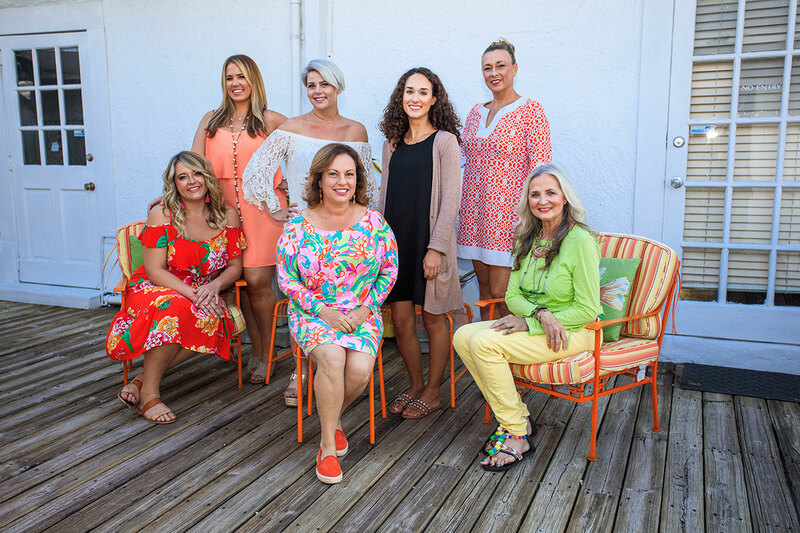 Tina Hardman’s cottage faces S. Dixie Highway and Vallete Way, and her citrus logo in hues of oranges, yellows and greens defines her place perfectly. Inside is a modern but homey mix of comfy couches, glass tables, wooden chairs, and crafty white wooden bookshelves adorned with a plethora of beauty products. These, of course, are all brands capturing that delicious and organic citrus blend, from shampoos, conditioners, hair treatments, styling gels, mouse and hairsprays. As you enter the beauty shop, the stylists’ stations harmonize the simple space that looks more like your girlfriend’s eclectic living room than a full service hair salon and spa. Citrus Hair Salon & Spa is such a catchy name. What inspired it? I’m drawn to those colors—the oranges, yellows and greens—and I wanted it to be something simple and identifiable, where I could have a logo that sort of branded us. And so, there it was born! Exactly, nine years ago. We officially opened in January 2010. What drew you to this location? Have you always lived in this area? I grew up in Lake Worth and my grandparents lived in the south side of West Palm Beach. So I was very familiar with this area. I also had a friend in the neighborhood who saw that it was for rent. And when I came to look at it, it was exactly what I was looking for. A cottage with the original wood floors, dramatic wall arches and fire place, which give it that homey feel. The perfect place for my hair salon. Did you always wanted to be a hairdresser and own your salon? I went to college first to get a business degree. In my small business introductory class, I created a mock small hair salon as a business. Ever since I can remember I was interested in that. I was that girl who helped everybody do their hair and make-up, but my dad said I should go to college first. And I did, which I’m very happy about, obviously. It really gave me that business background, with the finances and accounting knowledge, which I needed to open up my own business. Then, I went to cosmetology school and after that I started working in a salon in Boynton Beach. I did that for many years. When did you have that “Aha moment” when you realized it was time to open up your own shop? Well, I worked for other people for a number of years, and ultimately rented a chair in a hair salon , which is in essence like running your small business on a much smaller scale. But, I just had a vision of the way I wanted my salon to be, like the cozy and warm space and the homey environment that I mentioned about. And that’s what I set out to do here. Did you set up shop here by yourself? No, it was me, an assistant, and one girl who did massage and facials. Since then you’ve expanded your services. What do you provide now? We offer all kinds of hair services, from cutting and color to special hair treatments and hairdo’s for special occasions. We also do nails—all natural—no artificial nails. Because we’re a small shop, we can’t have all those harsh smells that come from doing artificial nails. As far as the spa area, we do waxing, facials and massage. This area was a bit different in 2010. The tea house was here but there was no Table 26 or Grato restaurants across the street. How long did it take you to meet the neighbors and become the neighborhood hair salon? I knew it was a good neighborhood, with a lot of families in the area, so it didn’t take long before we found each other. We are not a seasonal business; we are very much part of the neighborhood. West Palm Beach is thriving, and you’re in the midst of several historical neighborhoods, such as Mango Promenade, Flamingo Park, El Cid… You’re centralized in a very strategic location. West Palm Beach is a city where people want to live in. And yes, as a matter of fact, this building is historic designated, and I knew about this location because I already had several customers who lived in this area, which has grown a lot in a short amount of time. What are your thoughts on the renovation that will hopefully take place soon on S. Dixie Highway, which calls for a slimming of this road to one lane in each direction, with a turn lane in the middle, and a plaza-like look at Flamingo? It’s a road facelift similar to what the 300 Block on Clematis Street has experienced. How do you think it will affect your business and others around you? It will be very good when the City vamps up this street, and makes it more pedestrian friendly. We also need better parking and more cross walks with traffic signals to make it safe for everyone. I think beautifying the S. Dixie Corridor and having more businesses coming into a very concentrated area is a very good focus. The cottage corner, as your staff lovingly calls this set of four cottages, is owned by four female business owners, including yourself. How do you complement each other? We all offer different services, which is a good start. [laughs] We do a little promotion for Audrey Farrelli, owner of Serenity Tea House & Cafe, to get people to know her. When our clients are here, they can order lunch from them and they bring it over. Great service for our clients, and great extra business for them. Their lunches are wonderful and presented nicely on a glass plate, which again, adds that homey, fuzzy feel that we like to present with each of our services. If someone is here getting their hair done for an event or something, we suggest they visit Flor for jewelry. Teresa Dulong on the other cottage does lashes extensions. So, we all offer something different and that’s great for our customers. Have you ever done anything collectively, like a fashion show? Interesting you say that. Yes, we’ve thought of reaching out to local boutiques and doing a fashion show right here in our courtyard. We can do the hair and make-up, Audrey can serve some light refreshments, and Flor can provide the jewelry. On our end, Citrus has hosted several similar parties here to donate the profits to charity. We did one for Animal Rescue one year, and Dress for Success another time, so we try to put out some good vibes in the neighborhood. Supporting our community is super important to us, because without them, we have no business. Through our clients, we get involved in various things too, like schools, non-profits, and other organizations. We give away special spa days or hair, make-up and nails giveaways so they can come and see what we have here and they can experience it first-hand. I have to say that we always get repeat business out of that. So, it’s a very worthwhile thing all the way around. Aside from this neighborhood and its surrounding areas, where do your clients come from? We have some clients that come from Palm Beach island and many others from downtown… and we have one who comes as far as Singapore! Her family lives here so she visits them a few times a year. And when she does, she always comes here to get her hair done.